If you’re looking for a luxury watch with practical value and a sporty look, try the Tag Heuer Formula 1 Men’s Watch WAH1111.BA0850. With a reasonable features and a clean face, this watch will work best for those seeking a straight-forward timepiece. A view of the WAH1111.BA0850 Formula 1 watch. Born of a company that dedicates itself to precision and performance, this Formula 1 watch is equipped with features essential to chronographs, while avoiding too many extras and thus keeping the face clean. The WAH1111.BA0850 has the usual minute and hour hands (covered with an extra layer of luminous paint so as to make the watch useful even in the dark), plus a slender second hand that narrows to a point fine enough to tell exactly where it is on and between seconds. These are clearly labeled in increments of five, making for a quicker and easier read. (The hour markers aren’t labeled, but have luminous swatches that mark their place and will make them more visible.) All the hands move thanks to reliable Swiss quartz machinery, which is well-protected inside a watch with a 200m water resistance rating. The bezel—yet another useful and practical feature—turns to allow for effortless increment measurements. It’s also scratch resistant, as is the sapphire glass that covers the face. To finish off its functionality, this Formula 1 watch includes a date feature at 3 o’clock, and thus covers the range of day-to-day information the wearer would one to know, from day of the month to second of the hour. The composition of the WAH1111.BA0850 makes it both durable and allows it to sell at a retail price of $900—less expensive than some other luxury watches. The case and bracelet are both made of stainless steel; both the bezel and the crown are titanium carbon coated, the latter advertised as “Easy Grip.” In combination with the white face, black bezel, and red accents, the metal makes this Tag Heuer watch look sporty and masculine. 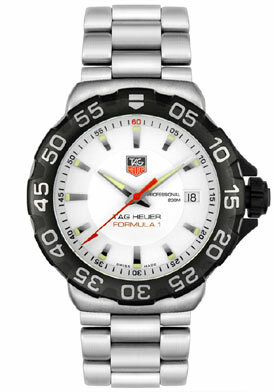 The Tag Heuer Formula 1 Men’s Watch WAH1111.BA0850 rear view. There are only things that I can anticipate going wrong with this watch. The first is that while the sporty look is great for more casual home and office outfits, it might not go as well with business suits and the like. 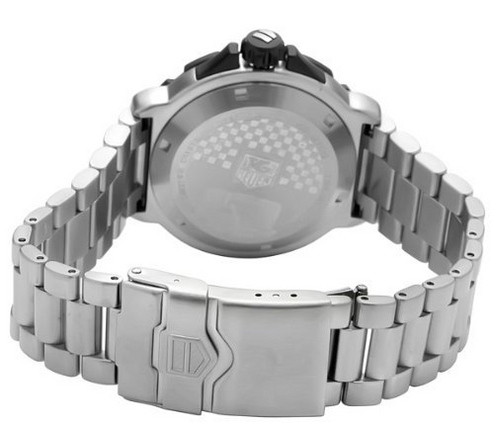 Then there is also the fact that the model appears to be out of date—Tag Heuer no longer manufactures the WAH1111.BA0850. This will not only make it more difficult to find and purchase, but also brings to question why it has fallen out of step with the latest and greatest luxury watches. It’s something to consider before making such a large purchase. Overall, the Tag Heuer Formula 1 Men’s Watch WAH1111.BA0850 will serve well those who want a simple but functional watch without too many frills. For similar watches, take a look at the rest of the Formula 1 collection.